Homemade Ghee Recipe... — Mamma JonesCONSCIOUS PREGNANCY, RAISING SUPER HEALTHY CHILDREN, BALANCED MOTHERHOOD & NATURAL LIFESTYLE, HORMONE HEALTH, MENTAL HEALTH, BUILD ROBUST IMMUNITY, HEALTHY RESPIRATORY SYSTEM, SKIN HEALTH, ANXIETY MANAGEMENT WITH THE TOOL OF ESSENTIAL OILS. I love making Ghee. It is something I make during the winter. There is something so nourishing and homely about the butter simmering away on the stove. The smell of cooking overtakes the house. Only one thing left to do.. plan what we use the fresh ghee for? What is ghee anyway and why is it so much better for us than butter and margarine? Let's start with why not to go for margarine?! I trust cows and nature more then chemist. Margarine has been invented to replace butter with it. Not a good idea. It is a highly processed food like the product, it isn’t a food. There is nothing in it I could call real natural food. You know the old fashioned food our grannies grew up with? The primary ingredient is vegetable oil. Most of the time hydrogenated ( linked to cancer), along with emulsifiers, colorants and various artificial ingredients. Butter, on the other hand, is natural. So why don’t I settle for butter? Because if I can make it better and healthier just by one simple step, why wouldn’t I? Ghee is clarified butter. Milk fats, sugar and lactose most importantly casein is removed during the cooking process. Is it pretty unbelievable right? Fats have the tendency to slow down the digestive system. Ghee is the opposite. It stimulates the stomach acids to break down food. If you don’t fancy making your own ghee and sourcing some cultured, organic, unsalted butter, Organic ghee can be found at your local health food store too, but it’s also very easy to make. Cut the butter into smallish cubes and place in the saucepan and let it melt. Once it has completely melted reduce the heat and let it simmer. Cook for at least for 45min. It's important to keep your eye on the butter. As it simmers away, it will go through lots of different stages. It changes quite a lot. Make sure you don’t burn it. Just simmer on low heat and don’t stir it often. The color should be bright yellow. When the ghee is done you will see a foamy layer on the top. That is all the casein separated from the butter. This is how you know it's done. Let it cool. Never handle boiling hot butter. Once it has cooled down, gently strain it through several layers of cheesecloth. The milk protein and the “muck ” as I call it, will remain in the cloth and the beautiful clean ghee will come out on the other end. 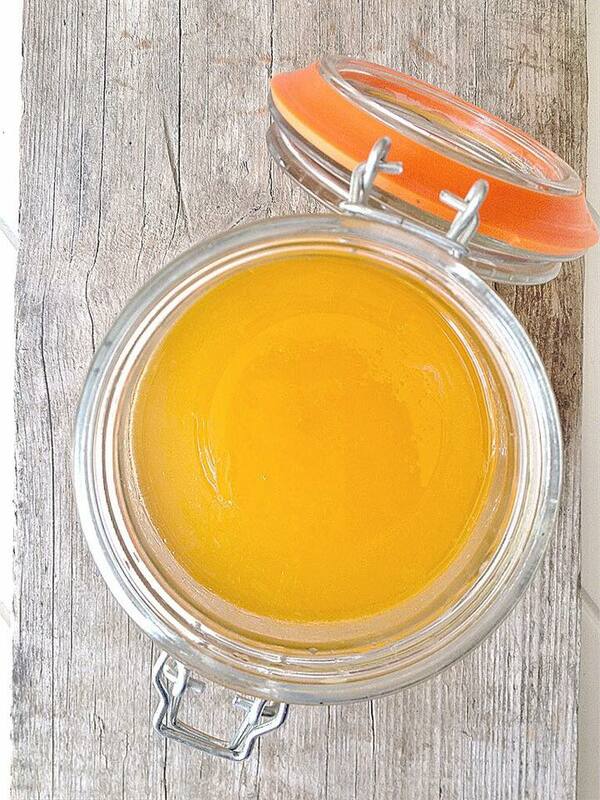 Sterilise a glass jar and keep the ghee in the fridge. It should last for months.